Northern Frederick County is home to three historic covered bridges. All three bridges are listed on the National Park Service’s National Register of Historic Places. The Utica, Loy’s Station, and Roddy Road covered bridges all cross streams in northern Frederick County, within twelve miles of one another. Besides their beauty, the bridges are also structurally interesting, as all three have different truss systems (which is what keeps a bridge standing). Click here for details about each bridge. These three bridges have a weight restriction of 30,000 lbs. Roddy Road covered bridge is posted for 8 foot 6 inch height restriction and Utica is posted for 9 foot 6 inches height restriction. Loy&apos;s Station is not posted for height. Use caution when viewing these bridges, these are narrow roadways and motorists may have difficultly seeing you. 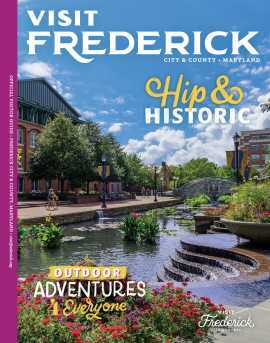 From Frederick City, the tour is approximately 33 miles long, roundtrip. Start the tour north of Frederick at the junction of US15 (Catoctin Mountain Highway) and Old Frederick Road. Turn right (east side of US15) onto Old Frederick Road. Drive 1.5 miles and make a left onto Utica Road, to Utica Covered bridge. Return to Old Frederick Road and make a left onto Old Frederick Road. Drive 3.9 miles to a stop sign. (Just before the stop sign you will see a sign indicating that you are now in Creagerstown.) At the stop sign make a left onto MD550. Drive 0.4 miles and make a right onto Old Frederick Road. Travel 2 miles and make a left into the parking lot of Loy’s Station Park. From the parking lot of Loy’s Station Park, make a left and go through the bridge. Drive 0.3 miles to a stop sign. Make a left onto Rocky Ridge Road (MD77). Drive 2.7 miles on Rocky Ridge Road and make a right on Apples Church Road in Thurmont. Go straight on this road for 1.6 miles to the bridge (the road will become Roddy Road at the Graceham intersection). Drive through the Roddy Road Bridge to a parking lot on the left. Getting Home: From the parking lot of the Roddy Road Covered Bridge make a right onto Roddy Creek Road. Drive 0.4 miles to a stop sign at the junction of US15. The ride back to the starting point is approximately 15 miles. If you are interested in other historic bridges of Frederick County, click here.